Financial services marketers certainly spend a lot of time and effort in understanding why people choose to bank with them or decide to bank with a competitor. 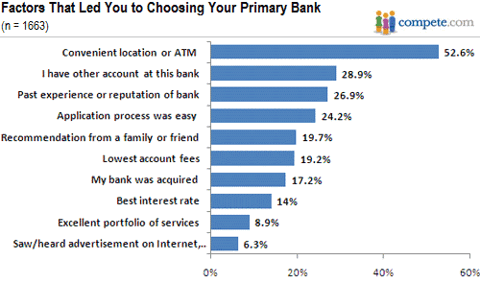 Compete recently fielded a survey to more than 1,600 online bankers to understand the factors that led them to choose their primary bank. Factors included a mix of both online and offline activities. The offline channel is by far the most popular factor that led online bankers to chose their bank. 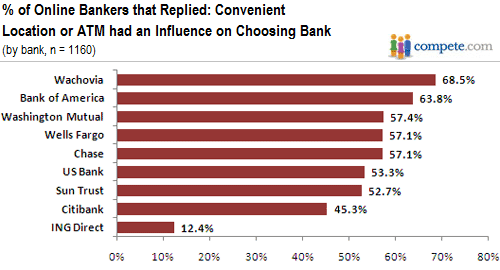 Among respondents, more than half selected “Convenient Location or ATM” as a primary reason for selecting their bank. The least likely factor to influence where they bank was “Saw/heard advertisement on Internet,TV.” Even so, Washington Mutual (NYSE:WM) led this category with 19.4% of its online bankers responding that this was a primary factor in selecting Washington Mutual. online bankers did not rate this factor as a primary reason — its six cafes are the closest it comes to branches. As online banking becomes even more popular among consumers, it should be interesting to see how whether the convenience of banks or ATMs continues to be a significant factor in people choosing their banks or if online channel factors become more important to consumers in the future.